It has happened again! My email system is playing up. I can receive emails but I can't send any! I was hoping the problem would clear up by itself like it did last time, but it hasn't yet. I'm sorry, I haven't been able to reply to emails but I am definitely here and definitely processing orders.I'm going to try sending emails from an alternate email address. I hope it works! 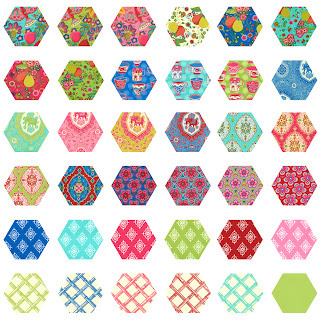 My favourite blogger, QuiltJane from Want It, Need It, Quilt! 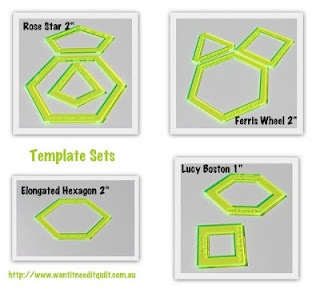 has got a fantastic new giveaway on here to showcase the latest additions to her own range of 'peeper' acrylic templates for English Paper Piecing. I have used Jane's templates and I love that the centres are cut-out. Fussy-cutting fabric is so easy as you can place the template at exactly the right spot on your fabric's pattern. Jane's giveway includes a set of Rose Star templates, a set of Ferris Wheel templates, and some elongated hexagons. 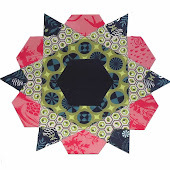 Oh, and a pack of my die-cut papers too! Jane and I have coordinated our products, so you'll find that her Rose Star templates match up with my die-cut Rose Star paper pieces. Her Ferris Wheel templates match up with my die-cut 2" square, triangle and hexagon papers, and if you need papers to match the Elongated Hexagons I can electronic-cut them for you. The giveaway blogpost includes this picture of my first Rose Star blocks, but you may remember that I restarted my Rose Star quilt in a less dramatic colourway. 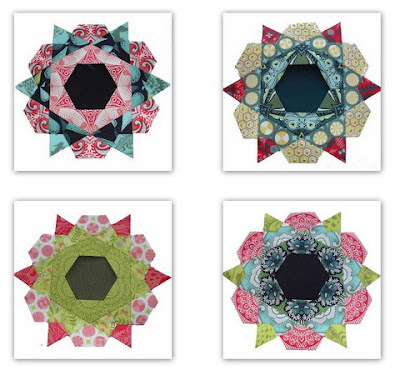 You'll find some photos of my Flora blocks here. And here's a photo of my still unfinished Faux Wedding Ring quilt. I didn't realise this was the Ferris Wheel block! 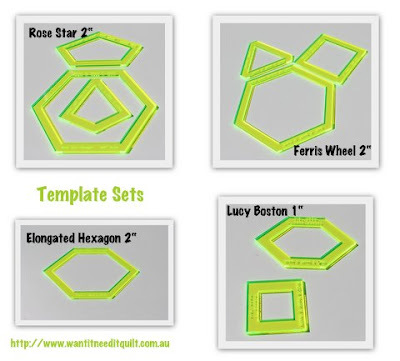 The acrylic template giveaway is open till Sunday 2nd September (Aussie time). 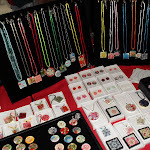 You can find the giveaway here and my coordinating die-cut paper pieces here. P.S. It has happened again - my emails are playing up - I can receive emails but can't send any! You can find some gorgeous photos and a step-by-step tutorial on Amanda Herring's blog, The Quilted Fish. 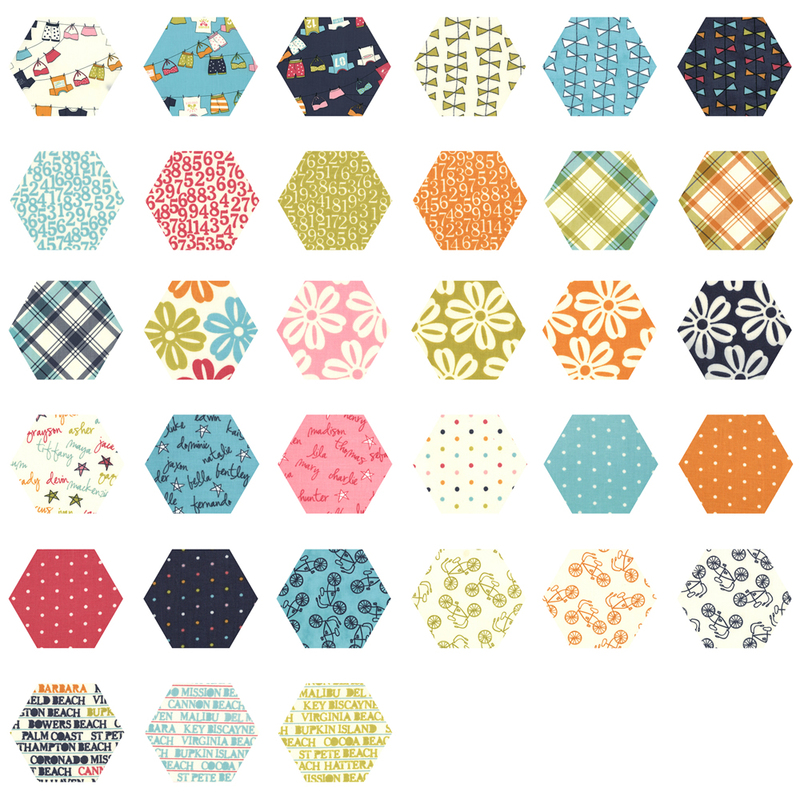 The large diamond die-cuts that you can get from my store are a fraction larger, but that doesn't affect the pattern at all, you don't need to calculate any adjustments. 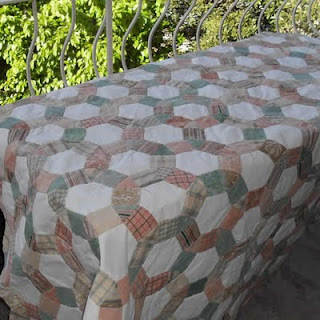 The charm quilt shown uses half a layer cake, but I'm using more to make a single bed size quilt. I'm not quite sure yet whether I'll need 1 1/2 layer cakes or 2. Oops, I'm getting side-tracked. I bet you all are here to find out who won the giveaway. The first name out of the hat was Maryjane, who suggested triangles in Giddy. Congratulations Maryjane, you've won a $50 voucher to use anywhere in my store. You don't have to use it all in one go, but it sounds like you've got something planned for those triangles. I'll be in touch. The other winners are Cecelia and Huisei, who both fancy large hexagons, Cecelia in Lucy's Crab Shack and Huisei in Trade Winds. Don't they both sound great? You've each won a $25 voucher. I'll contact you shortly.